25280 & 25243 at Peterborough on September 5th 1981. The sixteen year career of D7630/25280 started with almost two years on the Eastern Region, followed by the remainder allocated to London Midland Region depots. Built: Beyer Peacock Gorton Ltd, Works No.8040. Time between withdrawal & scrapping: 20 months. 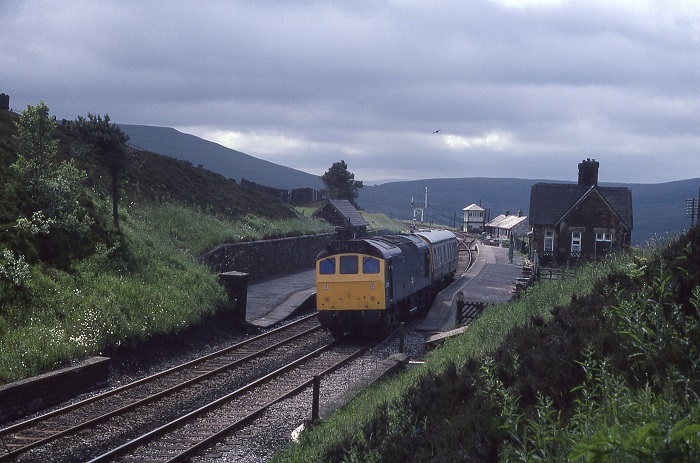 July 1967 to the LMR and then back to Wath (41C) during the same month. August 1967 to London Midland Midland Lines. 25280 was the 119th Class 25 to be withdrawn. After withdrawal 25280 was stored at Toton. 25280 (with 25148?) was moved to Swindon Works on March 18th 1982 and broken up by the end of July 1983. Due a Classified 3rd quarter 1969. Due a Classified 3rd quarter 1979. On July 22nd the summer dated 09.35 Sheffield - Llandudno Town and the return 14.28 Llandudno Town - Sheffield was worked by D7630. A less glamorous working took place on October 23rd 1968 when 7630 was noted heading towards Hull hauling 48369, 48356, 48373 & 48368 for scrapping. Photograph courtesy Kevin Hughes (HU00854). 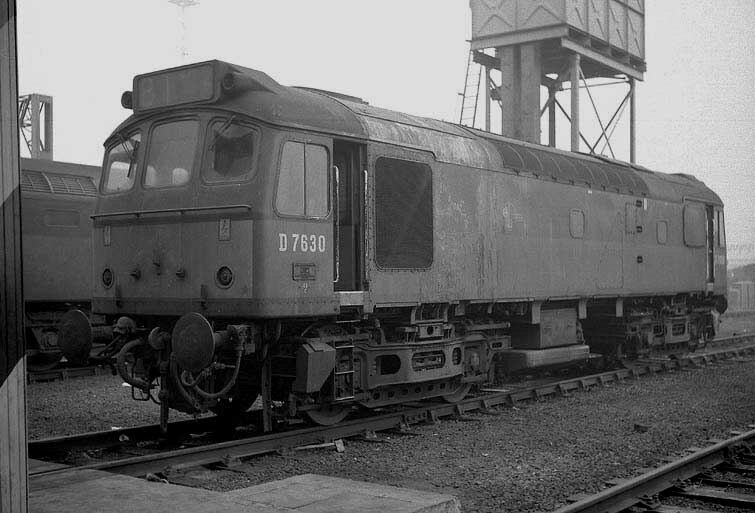 7630 at Bescot on September 3rd 1969. After four years in service the locomotive is looking workworn and due a Classified repair. The cabside still sports a faded white 41C stencil from its time at Wath. Class 25s 7630 & 7536 were noted coming off the Redditch branch with a train of mineral empties on May 26th. On July 25th 7630 & 7614 were noted on an unidentified passenger train between Wolverhampton and Birmingham. On October 1oth 25280 & 25060 were noted departing Birmingham New Street with an unidentified passenger train headed in the London direction. A Nottingham - Lincoln parcels was worked by 25280 on March 17th. 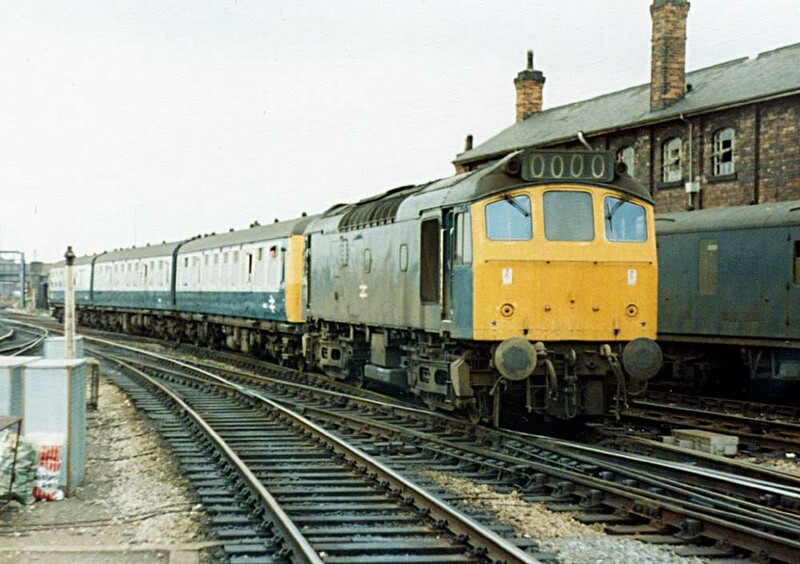 On May 24th 25280 & 25074 worked the 08.00 Walsall - Yarmouth to Leicester, being replaced there by 25083 & 25102. On June 21st 25280 & 25081 worked the 08.00 Walsall - Yarmouth to Norwich, they did not return on the diagrammed working. On July 3rd 25165 & 25280 were noted on a Derby (?) - Yarmouth passenger service. August provided 25280 with some passenger work. On August 7th 25280 & 25133 worked a roundtrip Derby - Skegness service, whilst on August 17th a roundtrip Derby - Skegness was worked by 25280 & 25212. On August 28th 25280 & 25268 had a trip down to the West Country with the 09.49 Nottingham - Paignton, for a total of 261 passenger miles. 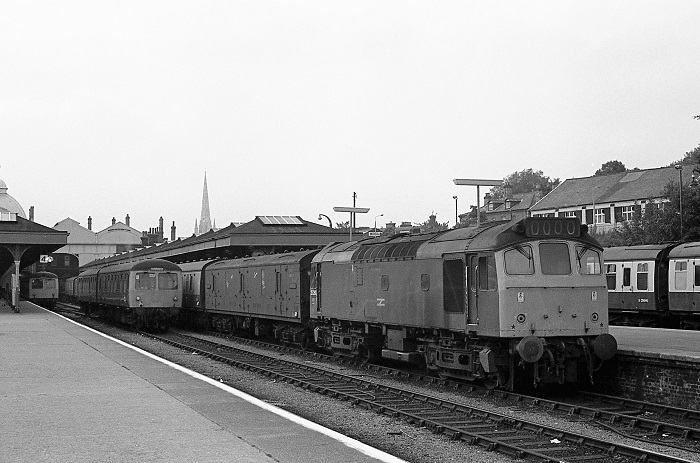 On August 30th 25280 & 25075 worked a roundtrip Derby - Skegness relief (it is also reported that on this day 25280 & 25268 worked a Wellingborough - Hastings day excursion as far as Cricklewood). 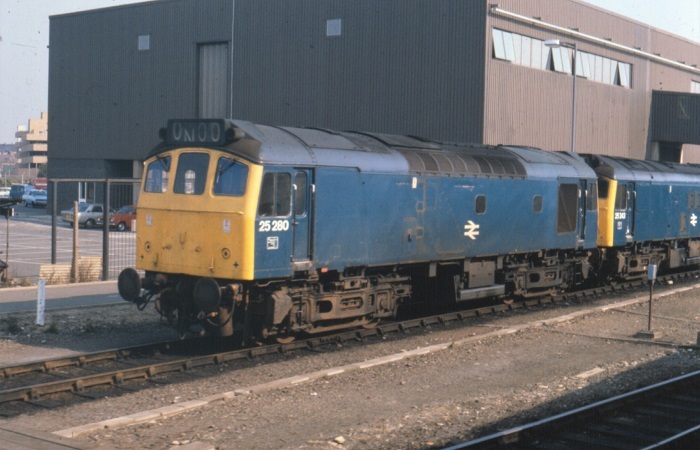 The failure of a diesel multiple unit on September 30th saw the 13.20 Crewe - Derby worked by 25280. 25280 was noted during the evening of October 13th with a westbound train of concrete sleepers seen at Uphill junction. On March 18th 25280 was noted shunting grain wagons at Shobnall Wharf (Burton on Trent). 25280 was noted at Thorpes Bridge Junction, Newton Heath, with a loaded Great Rocks - Dean Lane ICI stone train on May 31st. On July 5th 25280 & 25150 worked the 09.20 Derby - Skegness and the return 19.20 Skegness - Derby. The 18.35 Birmingham New Street - Norwich on August 2nd was worked to Peterborough by 25280. A week later on August 10th a Shrewsbury - Cambridge special was worked by 25280 & 25107. On June 3rd the 08.00 Walsall - Yarmouth to Norwich and the return 14.15 Yarmouth - Derby from Norwich were worked by 25280 & 25271. The 08.45 Manchester Victoria - Scarborough was worked by 25280 on September 2nd. Two days later on September 4th the 07.47 Manchester Victoria - Bangor and the 11.30 Bangor - Manchester Victoria were worked by 25280. Photograph collection of webmaster. 25280 at Norwich on March 7th 1979, at this time it was allocated to Toton. 25280 is recorded as hauling at least one Birmingham - Norwich passenger service. The 04.15 Shrewsbury - Aberystwyth and the 10.09 Aberystwyth - Euston to Wolverhampton were worked by 25280 & 25301 on June 16th. The next day (17th) the 08.45 Birmingham New Street - Barmouth and the return 17.45 Barmouth - Euston to Wolverhampton were worked by 25280 & 25195. 25280 was noted southbound at Derby with a seventeen wagon mixed freight with brakevan on June 1st, and was later noted passing Cheltenham with a longer freight (lengthened by about a dozen loaded bogie steel wagons), but now double headed with 31306. On July 28th the 08.25 Leicester - Blackpool North was worked forward from Nottingham by 25280 & 25248, returning to Nottingham with the 14.25 Blackpool North - Leicester. Photograph courtesy Steve Morris. 25280 at Derby on July 29th 1979 dragging a three car Swindon unit. A roundtrip Leicester - Skegness was worked by 25280 & 25161 on August 2nd. Two days later on August 4th 25280 & 25261 worked the 08.25 Leicester - Blackpool North from Nottingham, returning as far as Nottingham with the 14.25 Blackpool North - Leicester. On August 12th the relief 09.15 Nottingham - Skegness and the return relief 19.07 Skegness - Nottingham were worked by 25280 & 25270. 25280 was noted passing through Peterborough with a mixed freight, possibly a trip working from Ketton, on June 4th. The end of August produced some passenger workings for 25280. On August 28th the 15.18 Norwich - Birmingham New Street was worked throughout by 25280. Two days later on August 30th the 04.10 Shrewsbury - Aberystwyth and the return 10.07 Aberystwyth - Euston to Wolverhampton were worked by 25280 & 25242. The next day, August 31st, the 08.45 Birmingham New Street - Aberystwyth was worked to Wolverhampton by 25280 & 31245, at Wolverhampton 31245 was replaced by 25073. The Class 25s returned with the 18.10 Aberystwyth - Euston to Wolverhampton. On September 9th the 07.35 Nottingham - Llandudno Town and the return 13.00 Llandudno Town - Nottingham were worked by 25280. 25280 was noted southbound at Tamworth Low Level on October 10th with a loaded ballast train. Condition October: blue/yellow livery, boiler room grilles sheeted over, straight sided sandboxes, three-rung bogie mounted footsteps, No.2 cab 2nd man's side - corner shows signs of a minor scrape, with three distinct scrapes. 25280 was the Manchester Victoria pilot on a rainy May 22nd, the No.1 cab had badly faded/missing yellow paintwork. Photograph collection of webmaster. 25280 northbound at Dent on June 30th 1981 with a Division Manager's saloon (?). 25280 was noted at Northwich depot on July 12th. An interesting combination occurred on August 8th when 25280 & 27001 worked the 01.20 Stranraer Harbour - Blackpool as far as Carlisle. On August 22nd the 08.35 Derby - Yarmouth to Norwich and the return 14.20 Yarmouth - Derby from Norwich was worked by 25280 & 25274. An Ealing Broadway - Skegness day excursion on August 25th failed behind 47147 north of Burton-on-Trent, 25280 & 25274 dragged the service to Nottingham where 45049 replaced everything. On October 9th 25280 was noted running light engine from March to Stratford passing Broxbourne at 10pm. 25280 was withdrawn on November 8th 1981. Page added November 16th 2012.